Review: Approximating some ideas from new bands who rose while Slayer was enduring fifteen years in the music business, this new album features riffs that sound more like later death metal during verses, and chanted choruses over bouncy riffs that are more like what Metallica was shipping five years previous. A few chords create motion, and then the riff rides a single chord in a single rhythm to allow drums and vocals to take center stage, accommodating a new vocal style that incorporates more melody and a compositional style that is more like rock in its use of rhythmic expectation. 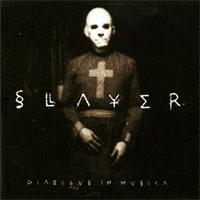 This combination of foreboding riffs and jaunty emotional choruses transitions Slayer toward the cutting edge of nu-metal where it meets the underground, and shifts into the public eye an album that may not delight fans of the older material but approximates what a younger audience recognize as the norm.